Re the capped upstream, that was supposed to be fixed not long ago. It clearly isn't. Your quickest solution may be to post in the Community Forum and ask for it to be uncapped. (You'll probably see a few similar posts there. Alternatively PM ChrisParr who posted earlier in this thread. He can do it. A PM might alert him, which is quicker than waiting for him or similar to see your speed here. 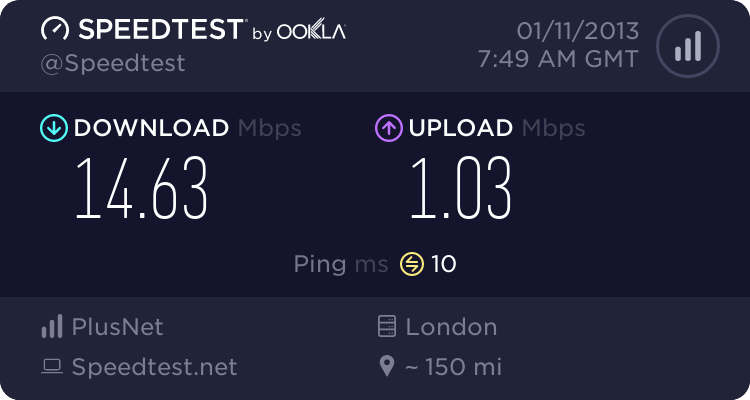 Thanks for the advice, I posted onto the PlusNet forum and this morning here's my speedtest result, upload improved but download worse. Is that testing speed on wireless, rather than wired? The downstream connection speed is comparable - though a daytime re-sync may restore that. When worried about speed tests, always run wired. If the first time after a reconnection/re-sync, always include the text results boxes from a BT speed test as those show the IP Profiles, (in particular the downstream one); and on ISPs such as Plusnet who also hold and use a copy of the BT IP Profile check the copy corresponds to the BT one within a few hours of the re-connection.. 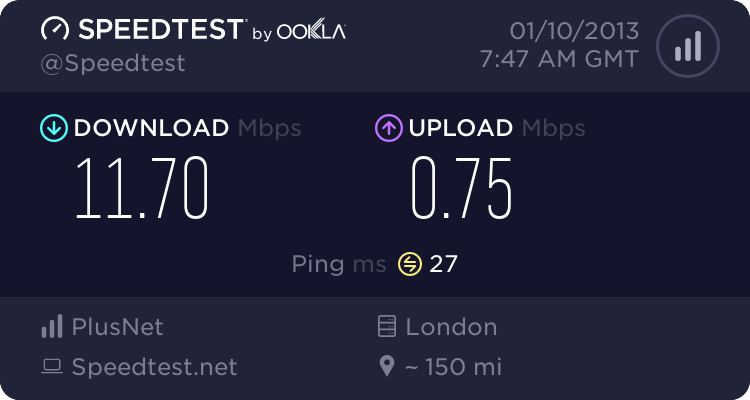 Here's a speedtest result from this morning, I'm fairly happy with this as from the start of this thread I have basically more than doubled both my download and upload speeds.